When booking a chalet someone has to bring a copy of an Identity document and a stamped proof of account from the bank on arrival in order to fast track the refund. Continue along the N6 towards East London and you will see a sign indicating (East London 10km). Carry on the road until you come to a large traffic circle, turn left at the circle onto the N8 continue for +- 500m and take a left onto the M10 (this is the old Gonubie main road). Continue along this road +- 12km, you will come into Gonubie Suburb continue along the main road until you come to a Spar Shopping Complex on your right-hand side. Continue for 50 m and on your left-hand side there are two sports fields, in between the fields is a road to your left and there is a sign indicting Gonubie Caravan Park and Chalets, continue along this road, go down the hill and you will drive into the Caravan Park. Continue along the N2 from the Umtata direction. You will pass the Brackfontein turn-off, continue for more or less 10 minutes, then take a left turn onto the Gonubie off-ramp then turn left onto the Gonubie Main Road. 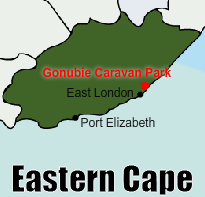 Continue along the Road for 8km until you pass the Spar Shopping Complex on your Right-Hand side, just after this between 2 sports fields, there is a sign on your left hand-side with Gonubie Caravan Park and Chalets on it, follow the sign down the hill and you will enter the resort. Take N2 via Grahamstown, King Williams Town to East London. Continue on N2, until you get to an off-ramp which takes you to Gonubie / East Coast Resort. At Stop Street, turn right to Gonubie. Continue straight down the Main Road, pass Gonubie Super Spar and then take 1st turn left (riverside Road) and continue straight down until the end of the road, to entrance of Gonubie Resort.